Lincoln Aquatics is the leading national Distributor of commercial swimming pool equipment, chemicals, and aquatics supplies in the country. For over 60 years, Lincoln's reputation has been built by our knowledgeable staff, providing prompt personal service and by carrying the highest quality products available. We know you have a choice of who you buy from and it is our mission to separate ourselves from the other suppliers in the industry. We accomplish this by exceeding your expectations and offering you value in what you purchase. 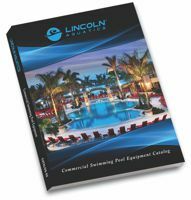 The 200 page Lincoln Catalog and our Lincoln website contains the most comprehensive selection of aquatic supplies in the industry. Our products are organized in an easy-to-use format, allowing you to quickly locate what you need. The Lincoln name is a trusted source for facilities across the country. We don't just sell the products we supply, but we service them too. Lincoln is a factory authorized Service Center. Our competitors can't say this. In addition, we are able to do our own installation of products at your facility, in many of the areas we cover around the country. Service, mechanical knowledge and ongoing support are key to what we provide to our customers. Our Lincoln Sales Staff offers unparalleled knowledge about your pool and how to solve your specific facility needs. In addition, we know about new technologies that can help you lower your operating costs. Our Sales Staff offers the ability to come meet with you on your pool deck in 37 states. No other company can do this. We are invested in your success and satisfaction and will be there over the long haul. Lincoln Aquatics is the leading national Distributor of commercial swimming pool equipment, chemicals, and aquatics supplies in the country. For over 60 years, Lincoln's reputation has been built by our knowledgeable staff and by carrying the highest quality products available.